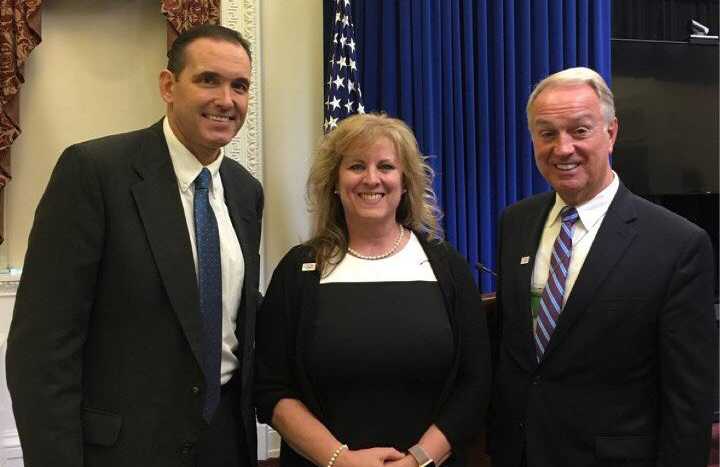 Greg Puckett (commissioner, Mercer County, W.Va.) Mary Ann Borgeson (commissioner, Douglas County, Neb) and Gary Moore (judge executive, Boone County, Ky.) at the White House Oct. 5. First Vice President Mary Ann Borgeson and Second Vice President Gary Moore attended an opioid summit Sept. 28 at the White House. Laura McKaskel has joined NACo as a staff accountant. Prior to joining NACo, she worked for the Navy League of the United States. She holds an MBA from Appalachian State University and BS in Health Education from the University of North Carolina at Greensboro. Blaire Bryant is now associate legislative director for health. She has worked at NACo for a year as a health program manager in the County Solutions and Innovations Department. Mary Ann Barton is now the County News editor and senior writer and will manage all editorial duties, including content, print production and mailing, the calendar, advertising and the budget. Charlie Ban is now the County News digital editor and senior writer. He will manage all digital content for the publication. Research Analyst Jonathan Harris presented a workshop on citizen engagement at the North Dakota Association of Counties Annual Conference in Burleigh County (Bismarck), held Oct. 7-9. Program Manager Jenna Moran attended and spoke at the Transportation Research Board as a panelist for the Resilience Summit Oct. 9-10 in Denver. Program Manager Jack Morgan participated in the Strengthening Economies series of Coal Reliant Communities forums Oct. 8-9 in Campbell County, Wyo. Associate Program Director Rashida Brown participated in a National League of Cities discussion Sept. 26 on county, state and regional alignment of policies and programs affecting young children, in Orleans Parish, La.